It's past midnight already and my housemates are already in lalaland. You probably wondering why i am still up in this wee hour of the night. We only have one computer and this morning i was kind of busy with everything and the husband was using the computer. The only time i could finish some of my blogging task is night time when the kids are sleeping. So, here I am watching Gran Torino while blogging. 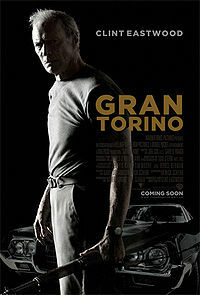 Gran Torino is a good movie in 2008. It is an American drama film directed and produced by Clint Eastwood, who also stars in the film. The film marks Eastwood's return to a lead acting role after four years, his previous leading role having been in Million Dollar Baby, and Eastwood has stated that this is his final film as an actor. The film features a large Hmong American cast, as well as Eastwood's younger son, Scott Eastwood, playing Trey.stars Clint Eastwood. It's a compelling tale of unlikely friendship that develops between a bigoted Korean war veteran and an Asian teen who under threat from some gangbangers, tries to steal his car: a cherry 1972 Gran Torino. It's a great movie with good story, so watch it if you have time. Yeah, I watched that in HBO. It's a good movie. It made me cringe realizing how old Clint Eastwood is already. waaaaa di na jud ko tig-tan-aw ug movie maski sa house lang oi kay kapuyan ko basta walay pop-corn nyak..